Hello everyone, not long ago we worked through the generic wiring diagram of the basic sewing machine. Today we are going to work specifically on one of the most common wiring styles found in a multitude of various manufactures sewing machines. Using an electrical fixture very much like a duplex receptacle and two standard two blade 120v plugins make it one of the most versatile methods which can be used on any machine in need of a control system. At the time of the writing of this post, we have re-wired dozens of machines that had incorporated this technique but I have never found a true name for this method. 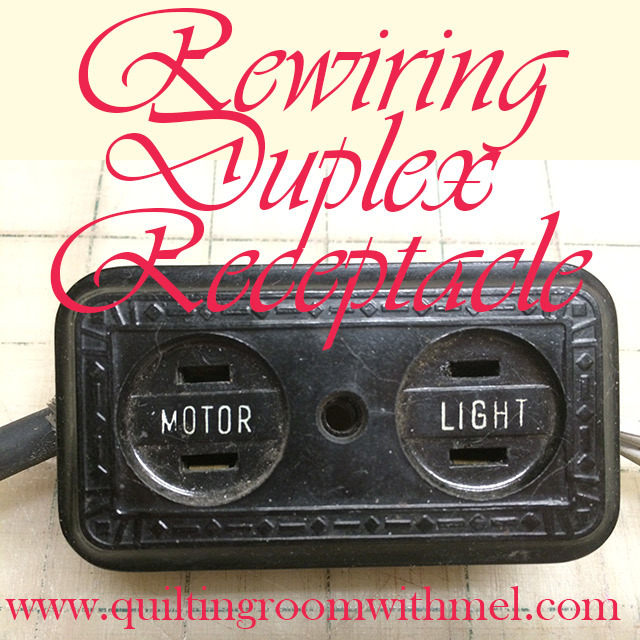 I typically refer to it as the Duplex system because it appears on the outside to be a 120v duplex receptacle with the words MOTOR over one plug-in receptacle and LIGHT over the other. However, that is where the similarity stops. Once the cover is removed, the wiring is nothing like a standard 120v outlet. 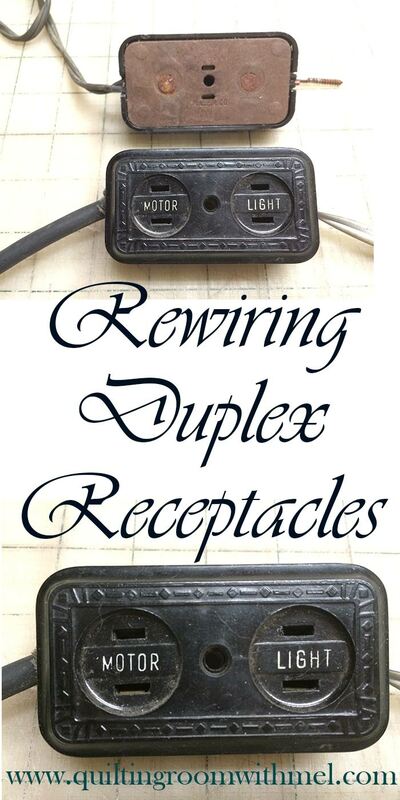 In a previous post (Rewiring Vintage Sewing Machines) I explained all about the Line 1 and the Neutral or Line 2 wiring identifiers and the importance of using the proper wires in order to keep the circuit from becoming a confusing mess. It will be equally important to be as meticulous with the wiring of this system as it was with the previous system as it will ultimately prove to be with any wiring project. If you find the terminology confusing please don’t give up. Instead refer back to the previous post and it will all be explained. If that doesn’t work in your favor we welcome comments and questions and enjoy helping where we can, so you can directly contact us and we will get back to you as soon as possible. This type of system is typically found in the portable table top models of any given manufacturer but it is not exclusive to the portables. It was also used on cabinet models as well. The only difference between the two has to do with the space requirements versus the ability to substitute some of the components with local hardware parts. For simplicity sake, we are going to approach this from the direction of a portable machine with the understanding that it can be adapted to the cabinet models simply by making the wires longer. Ok all that being said and done let’s get started on our latest new to us treasure machine. Of course, it's portable and when we pulled the lid off we noticed crumbling insulation on every wire we touch. As we look it over we see that the wiring from the motor and the light is nothing more than a pair of short (pigtails) wires with a standard two blade plug-in on the end. The two plug-ins match up with labels on the face of the duplex looking electrical box. One label is for the MOTOR and the other is for the LIGHT. The duplex is mounted by a single screw behind the handwheel in the space that was originally intended to house the various attachments and implements of sewing destruction. IE pins/needle/bobbins /seam rippers/scissors etc. Since we refer to the length as the side of a box and the narrow part as the front and back end, we can see a pair of wires exiting each end of the duplex. One of these pairs of wires will go directly to the motor controller, usually a foot pedal. The other pair of wires will go directly to the 120v source outlet on the wall. Since we are going to have to replace almost all the wiring we will start by unplugging the two pigtails from the duplex and removing the screw in the center of the duplex thus releasing it from the wooden box the machine is in. Oh yes, this reminds me, this style was also used in the plastic carry cases exactly the same layout excluding the mount screw. Instead, plastic pressure tabs were molded into the bottom of the case to hold the duplex solidly in place. The duplex is still removable. After we have the duplex out we can turn it over so we can see the bottom of the duplex. It has a HEAVY cardboard piece held in place by two press rivets. The rivets are easily pulled out if you can get a pair of pliers to grip the head or if you can get the jaws of a pair of wire cutters on either side of the head and pry up against the head of the rivet pulling the rivet from the Bakelite duplex cover. I have found that I like to use a pair of jewelers wire snips. They are very flat wire cutters and can be found in any craft store that carries beading or jewelry supplies and wire. They work great for pulling small nails and staples also. Now that we have the rivets out we can remove the cardboard to reveal the inside of the duplex. Pay close attention to the brass strips inside the duplex. If they come out during the wiring process its ok but they have to go back in exactly as they come out or when we are done we won’t get a connection from the wiring to the plug-in pigtails when we plug the motor and light back in. Some of these strips do not come out but most of them are free floating so to speak and they will easily move around and fall out. As we look at the brass strips we will see how the wires from each end are connected. Some are screw type terminals with the wire mounting under a screw. These are easy to deal with. Some of them are soldered to the wires coming from the respective components (foot pedal and power cord). Not as easy but still possible to manage with a minimum amount of soldering skill. Now before we proceed there are a couple of ideas I would like to share with you. First of all if the duplex is the type that will need the wires soldered back onto it and you absolutely do not want to solder, there is a second alternative to solve the problem and bring the new old girl back to the prime of her life, you can follow the wiring diagram from our earlier post using shrink tubing and crimp connectors. Slide the shrink tube on the wire make the connection and slide the shrink tube back over the connection and heat shrink it into place. These connections can easily be manipulated into living under the machine bed out of the way of the running gears and survive happily ever after. Remember not all of these old machines came equipped with a power switch because they were portable and were expected to be unplugged and stored away. So just omit the first switch from the circuit and proceed onward. Secondly, when I rewire these old machines sometimes the old two blade plug is too far gone to use again and must be replaced. We could go to the hardware and get new ends and about 10ft of wire and rewire it all the way through. Or we can go to a local for the cheap store and buy 3) 6ft indoor extension cords cut the plugs off of 2 of them the length we need for the pigtails. Cut the receptacle end off of 1) making a long pigtail to be used for the power cord to the wall outlet. Cut the receptacle end off of 1) of the left over pieces from the short pigtails to be used as the cord from the duplex to the foot pedal. Over all, it may cost a couple bucks more but we didn’t have to hassle wiring the plug-ins on and our wiring now has the molded plugs for a more finished appearance. Just an option it’s your choice so it will be right for you regardless of the decision. There is one downfall involved with replacing the two blade plug-in. The new replacement plug-ins will probably have the wide Neutral blade and it may not fit into the existing slot of the duplex. When I run into this situation I take a file to the brass blade and after a few strokes, the blade fits the slot. Now that we have our duplex removed from the machine and have disconnected the old wiring from the brass strips. We are ready to start reversing the process and start connecting our new wire. We are going to start with the power wire from the source and reconnect it to the duplex. We need to be sure when we start that we have our duplex facing the right direction so when we finish we will have it wired correctly and the machine will run like a dream. So we set our duplex on the table with the labels up so we can read them. The LIGHT end of the duplex should be closest to us or lowest in line from the edge of the table. Now we roll it over so the labels are now face down on the table. We will stay true to form and keep our duplex properly polarized. Because our duplex is facing away from us instead of towards us the Line (L1) is on the left side and the Neutral (L2) will be on the right. Before we start rewiring the duplex we need to make sure there is a connection from the L2 point of contact of the LIGHT receptacle to the L2 point of contact of the MOTOR receptacle. Sometimes it will be an inherent connection by design of the brass strip. BUT not always. Sometimes it will require a jumper wire between the two so the connection will be made. There must not be a connection between the L1 MOTOR receptacle point of contact to the L1 LIGHT receptacle point of contact. After visually confirming the points of contact we are now ready to start connecting the wires to the duplex. We are going to start with the L1 wire from the long pigtail power wire we made for the wall receptacle and the L1 wire we prepared for the motor controller. Both of these wires need to be connected to the L1 point of contact of the LIGHT receptacle. 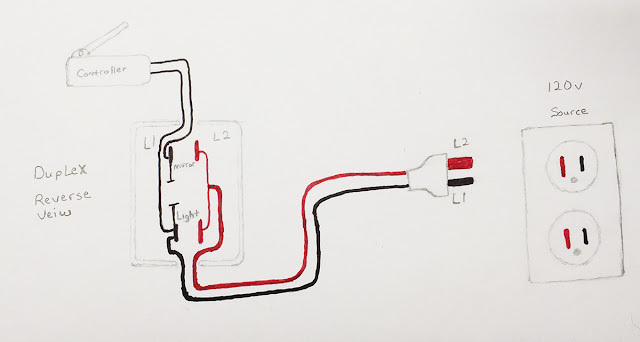 The L2 wire from the motor controller needs to be connected to the L1 point of contact on the MOTOR receptacle. The L2 wire from the long pigtail power wire needs to be connected to the L2 point of contact on the LIGHT receptacle. We are done with the wiring of the duplex and ready to reattach the cardboard back and push rivets and fasten it back into the case via the screw or the plastic locks. The short pigtails we prepared for the motor and the light are ready to be wired to the motor and light respectively. By carefully cutting the old wires about 1 1/2 inch from the motor and the light we can strip the insulation off of ½ inch of the wires and slide shrink tubes onto the insulation before we solder or crimp connect the new pigtails to the existing wires. After the connections are made the shrink tube can be slid down over the connection and heat shrank into position. Once this is finished we are done with the new wiring of the old beauty and she is ready to try out her new wings. Plug the motor plug into the MOTOR receptacle and the light plug into the LIGHT receptacle. Plug the new power wire into the wall outlet and turn on the switch for the light. It should light up and we will be ready to press down the motor controller. The motor should run in relationship to the position of the controller. Push harder it should run faster until max limit of the controller is reached, at which time the motor should be at full speed. This concludes our test and we are ready to begin a new Life of projects for our old machine. Until next time, enjoy your machines your way. Great designs are hidden by perfectly sewn blocks. This post saved me a great deal of trouble and money. I recently purchased a White Deluxe Zig Zag. It's in really good condition, however the foot pedal/power cord was cracked in places. So, I set about rewiring it. Sadly, I wasn't as observant as I should have been. I found your site, and it took me no time to wire it correctly. Thanks, you saved my bacon. THANK YOU!I so needed help rewiring my newest find. It was if you were actually working through this mess with me. How do you re attach the back cover or how do you cover the back of the receptacle block?